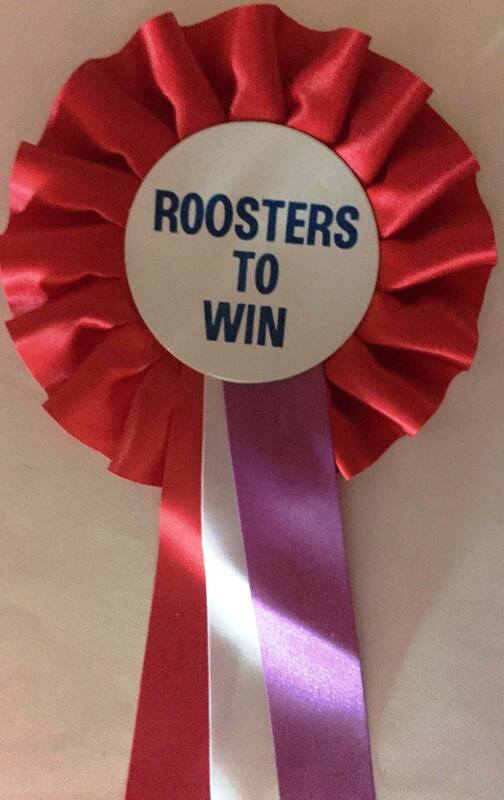 It wasn't until later on, I was always a Roosters fan, around 1978 when I was about 9 years old. My first thing was when we played the Dogs in the 1980 Grand Final. I still remember that image of how I felt we lost that Grand Final, I felt terrible. 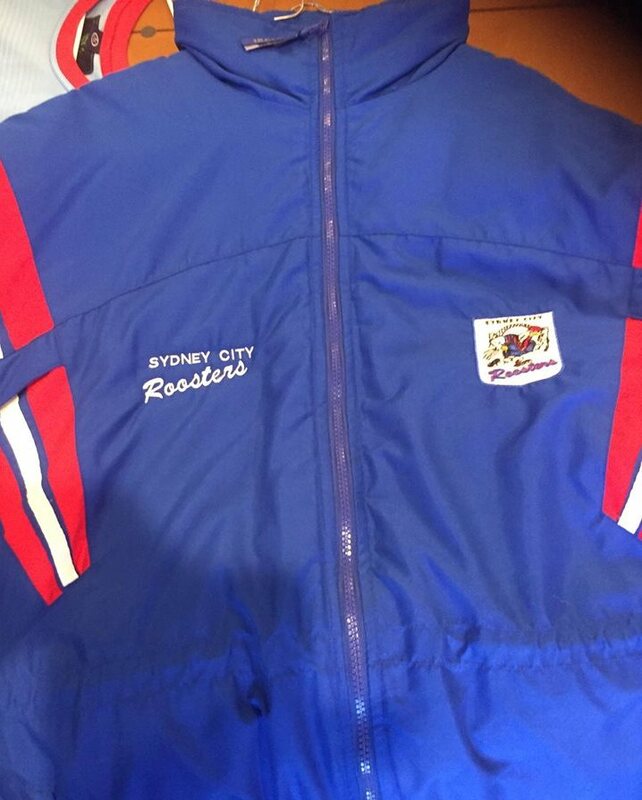 I had Footy cards first of all and then jerseys and training shirts. I didn't get into these until I was working and had disposable income and started collecting serious stuff. I always had all of the card sets as a kid. I remember playing the games at school as a kids, we would play flicks and swaps and I seem to remember some cards were harder to get than others. I was excited when I got the whole set, I wish I kept those sets until now but I didn't. When did you start to get into other things ? When Ebay came online and looking while sitting at home of an evening and browsing for Roosters items. 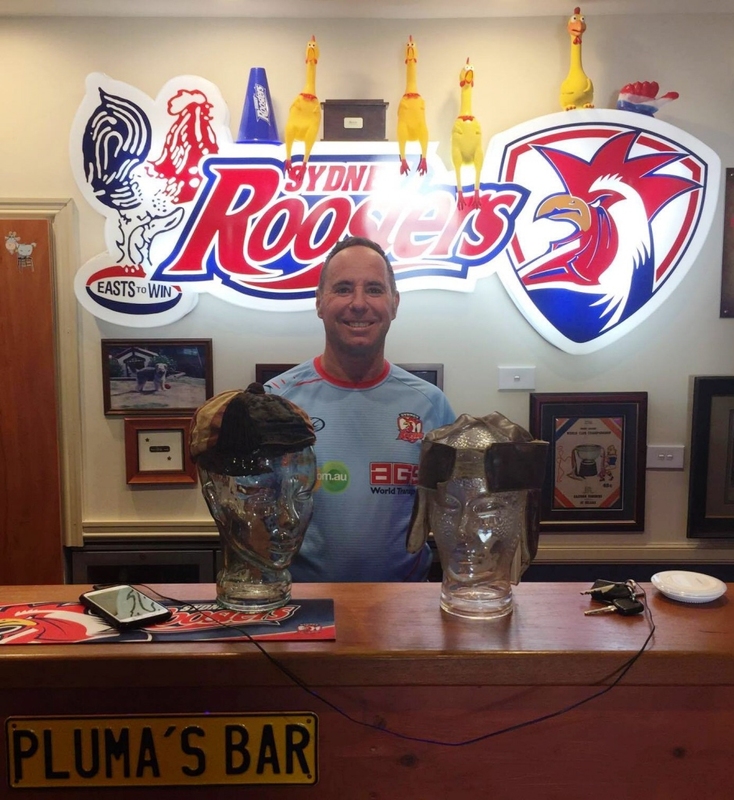 I am lucky with my work as well getting to meet lots of people and I also have mates looking out for me if they see any Roosters things. So I started getting into the jerseys and the training shirts during these days. That is a good question, the simple stuff do it for me anymore such as a plate or spoon set. It has to be something that stands out and is unique. I don't buy every years jersey now, I just buy the special ones and there are enough of those. I buy every training shirt, people think I am mad but I do get them all, I would have them all since the late 80's and I do wear them. I started collecting the badges, I really wanted the 74 and 75 badges and it took me a long time to get them. 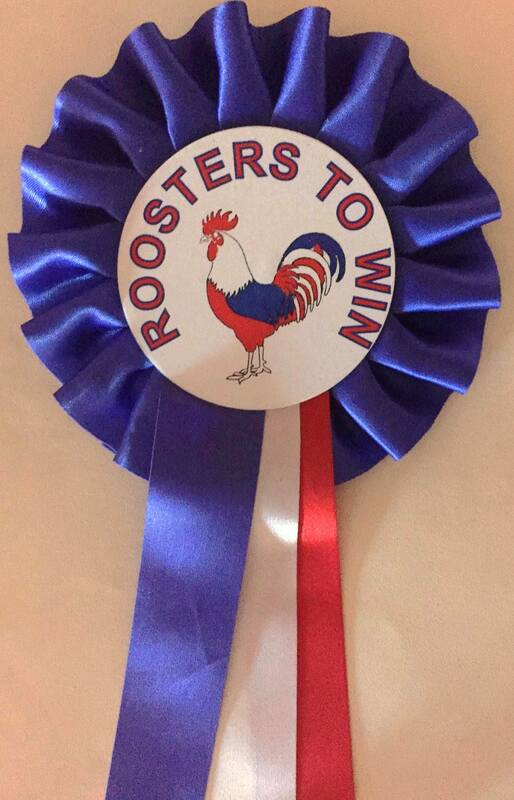 I have been collecting all of the Roosters and SCG badges for each year, some were easy to get some were $10 and some were lots of dollars. I still don't have all of the Associate badges, I may get them or I may not. I enjoy the chase, the hunt. I don't define myself on whether I have them or not. I enjoy the badges probably the most. 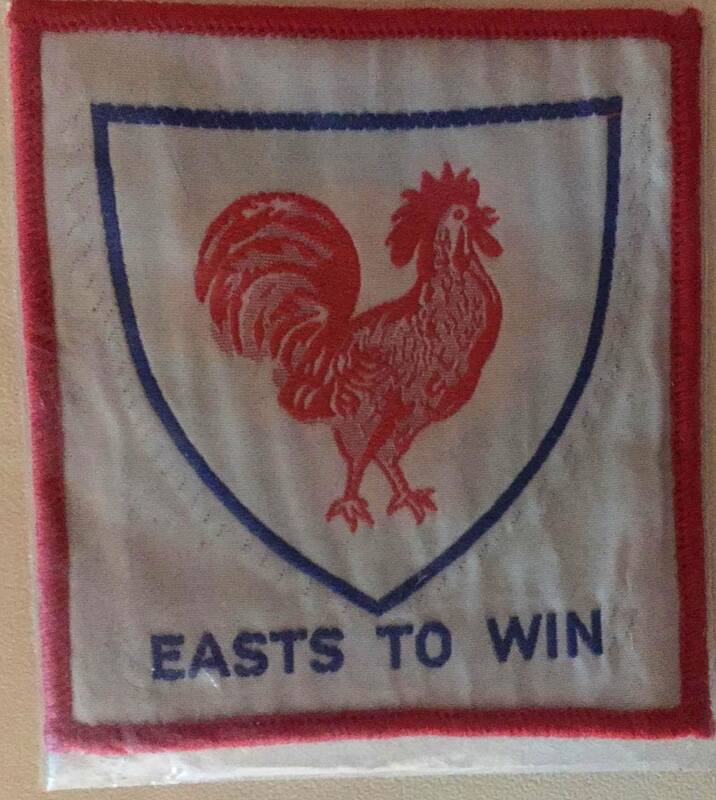 I have a bunch of Roosters Club journals from 1962, it shows players wages of the day, what player awards happened whether it be a chicken or a $10 voucher at the club, they are quite an interesting read. 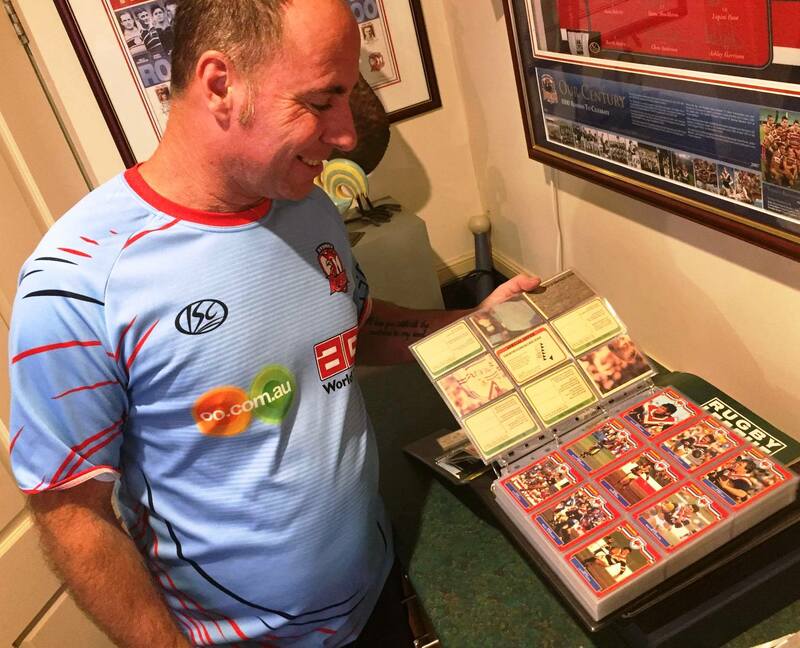 I have well over 1,000 Roosters footy cards, I don't have all of the Roosters cards that have ever come out, I can tell you one that I haven't got and that is the 2003 Luke Ricketson Jersey signature card. I have a jersey one but not a signature one, again it is a lot of money for one card. If I was on my death bed I don't think people will say you were a good bloke but you didn't manage to get that card. I still enjoy the cards and I look forward to the new sets that come out every year. They are making lots of cards which makes it hard for the kids, but for the serious collectors like myself that are prepared to pay the money. One day somebody will get the benefit of what I have here, I don't know who that would be, maybe my grand children. 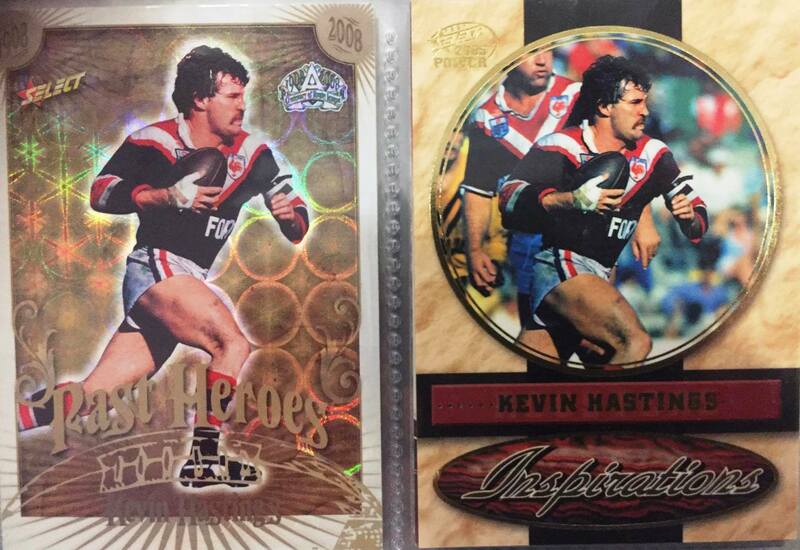 My favourite footy cards are the Kevin Hastings ones, mainly the Inspirations card from the 2005 Power Series. 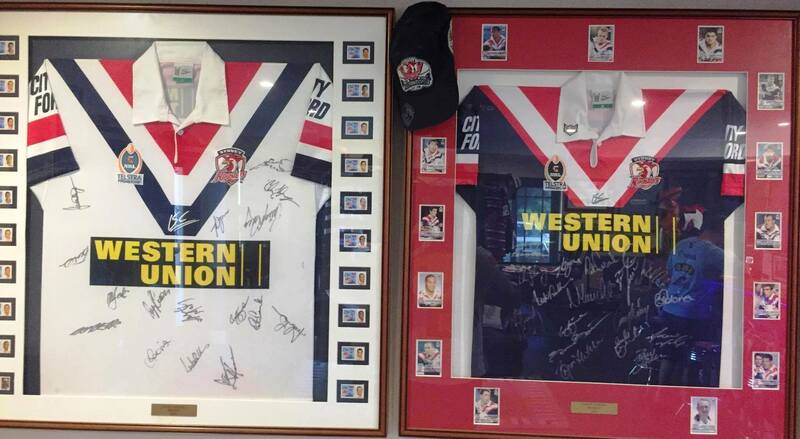 The two 2002 framed jerseys, home and away I had signed by the fellers personally. I had the cards and stamps put around the jersey. 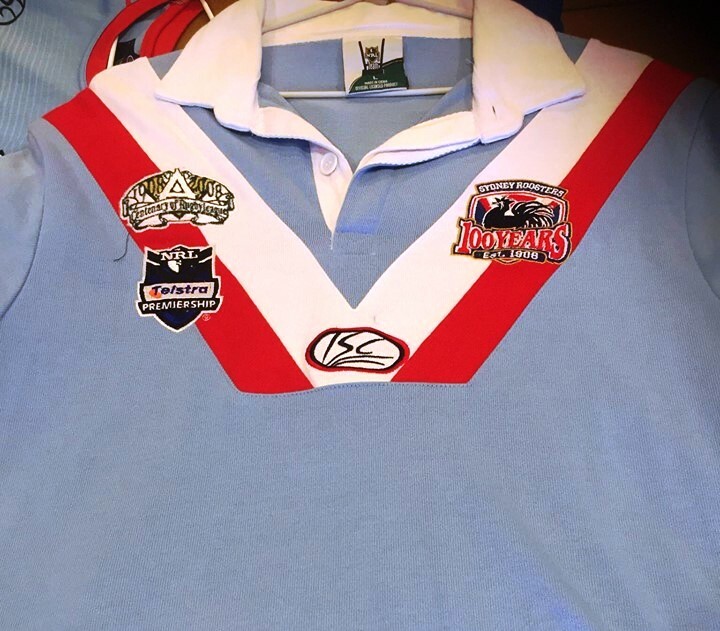 The 2007 Win jersey I won a good bet by putting money on the Roosters to beat St George by 13+ and they won 18 points to 4 and I used the profits to purchase this. 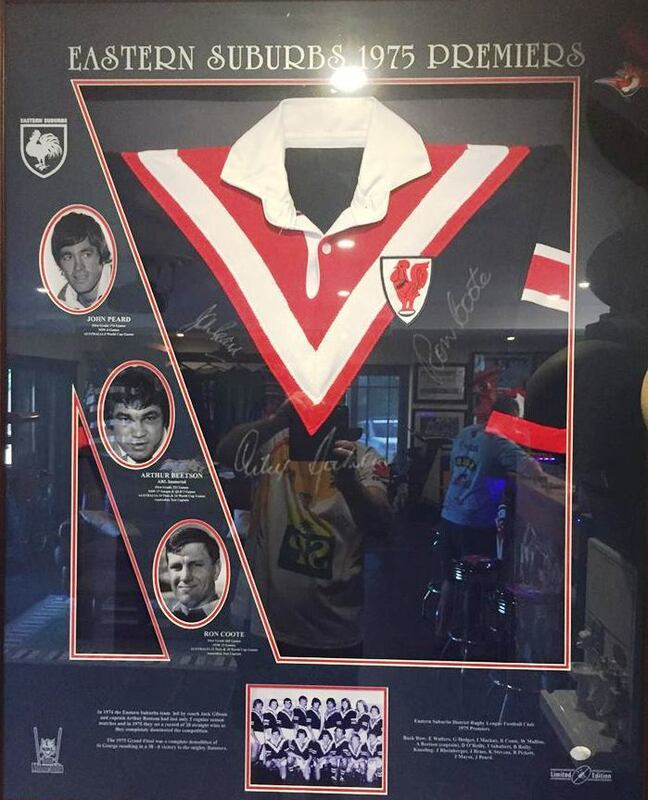 I have the 1975 Premiers jersey framed and it is signed by John Peard and Arthur Beetson. 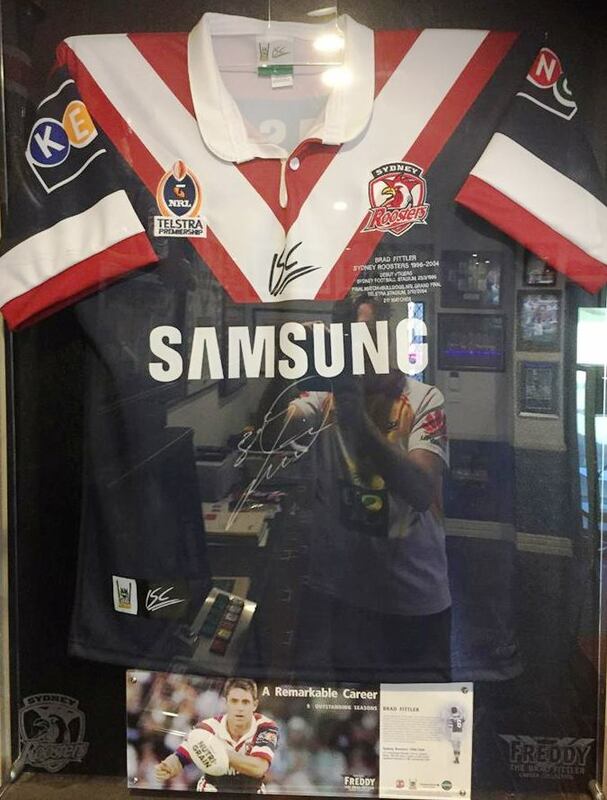 I have a Brad Fittler one signed and was bought directly from the club and it is limited to 100. 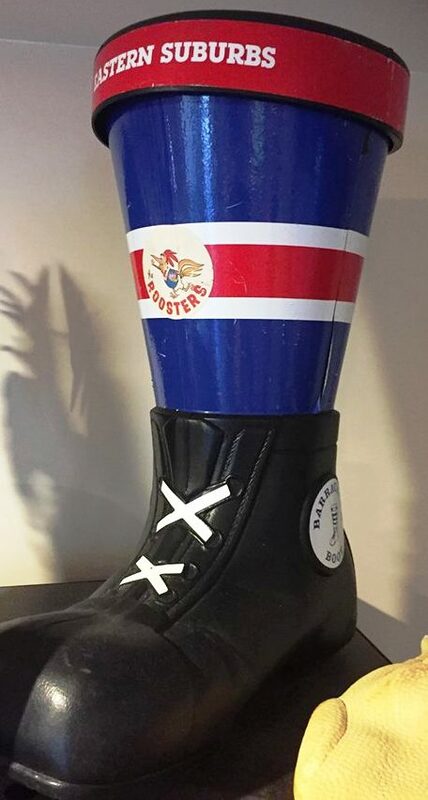 There is a Brad Fittler signed boot that is framed as well. 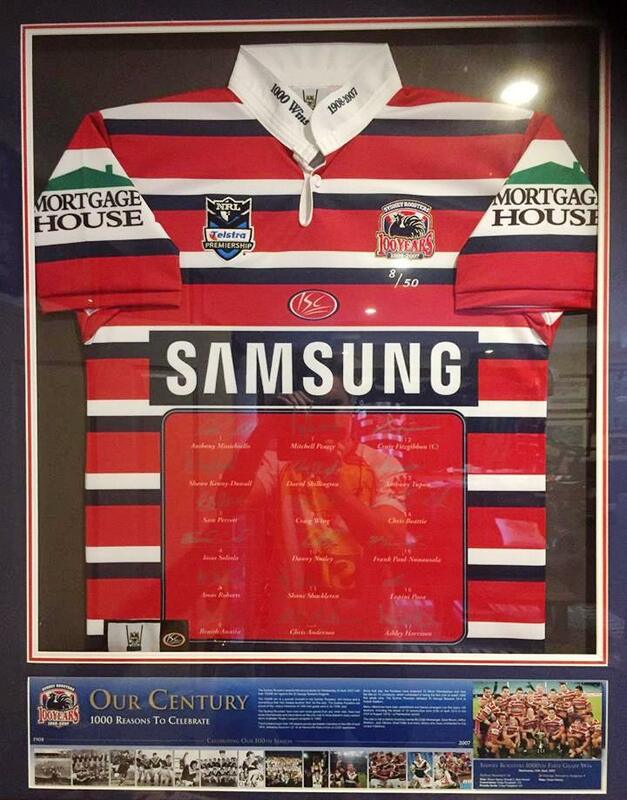 There isn't enough wall space with the likes of NSW and Kangaroo signed jerseys looking for a space as well. I have about 130 to 140 unsigned jerseys as well, I have quite a few and about 200 hats. 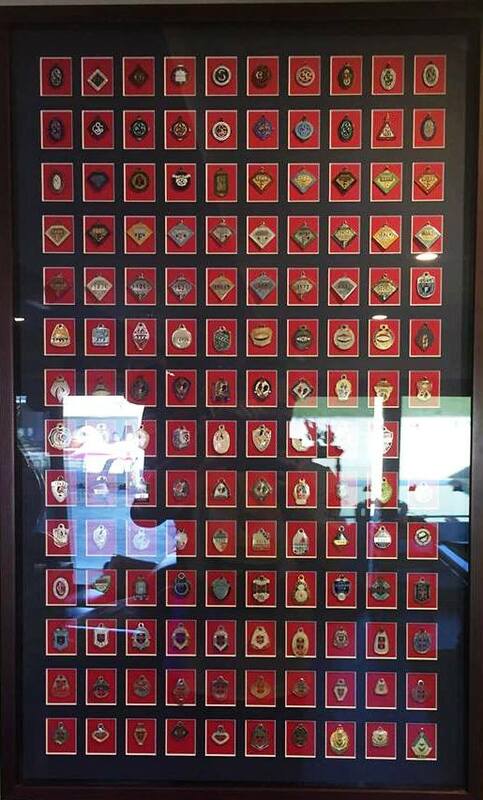 I have SCG badges and they start from 1901 and go through to 1988. 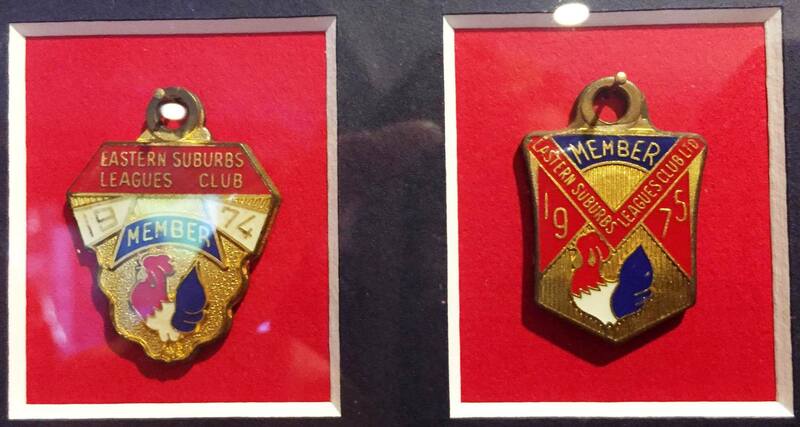 NSW Leagues club badges start from 1952 and they go right through to 1989. 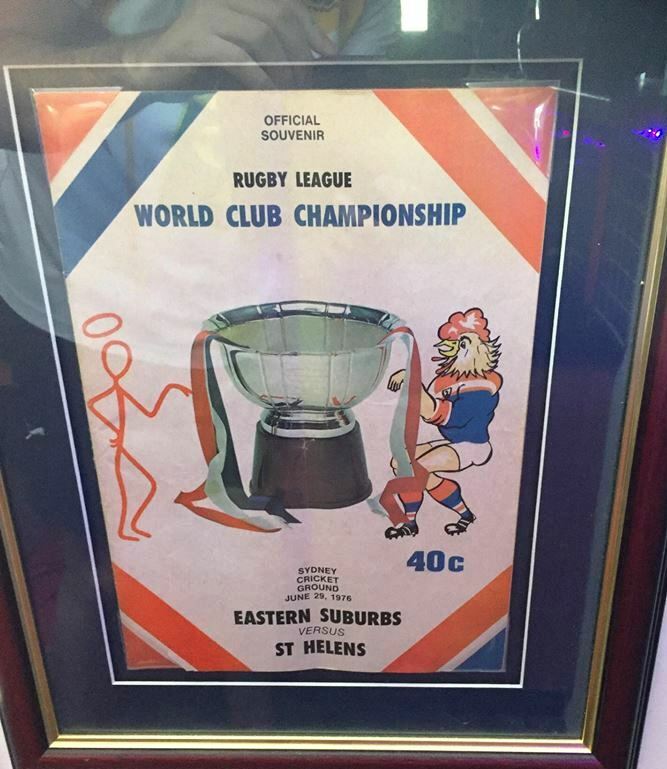 I really wanted the 1974 and 1975 badges, they are not the best looking badges by comparison but they are the Holy Grail of Rugby League badges. The 1971 and 1967 I had never even seen those badges anywhere, not in a picture or anywhere and one guy called me one day and said I have 1967 and 1971 badges, do you want them? I drove from here to St Leanords and bought them. I haven't seen them since. Why do you think people help you out with your collection? They know I have the passion, they know what I am into. I go to a few games, I live a long way from where the games are but I still go. Even when we lose I still love the team. Many times if people see something that is unique they will let me know. 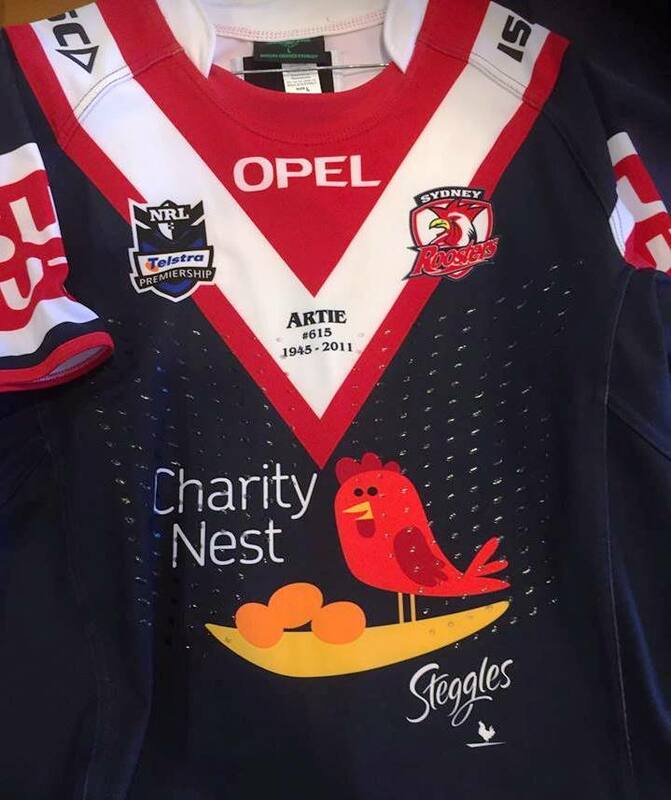 Another example is I could have a mate call me and say he is at a Charity Auction and there is a Roosters jersey do I want it and how much am I will willing to spend. 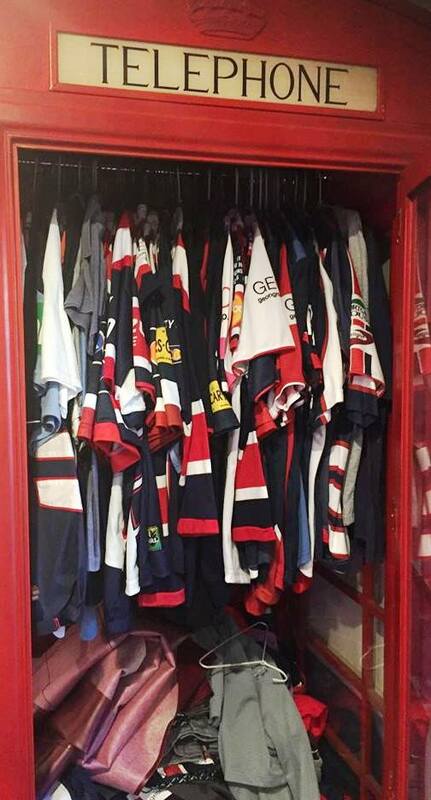 What are you favourite jerseys? That is a hard question, seriously probably the one with my name on it, members jersey from 2015. I have some aboriginal ones here. There is an Arthur Beetson one that was limited to about 100 and it sold out quickly, I tried to get a large but they had already sold out so I got a medium. I didn't make them again. I have the marvel ones and they make a lot more of those. There is a light blue jersey which is a reproduction of the 1945 jersey and during the war time they didn't have dark wool so they had to use the light blue. 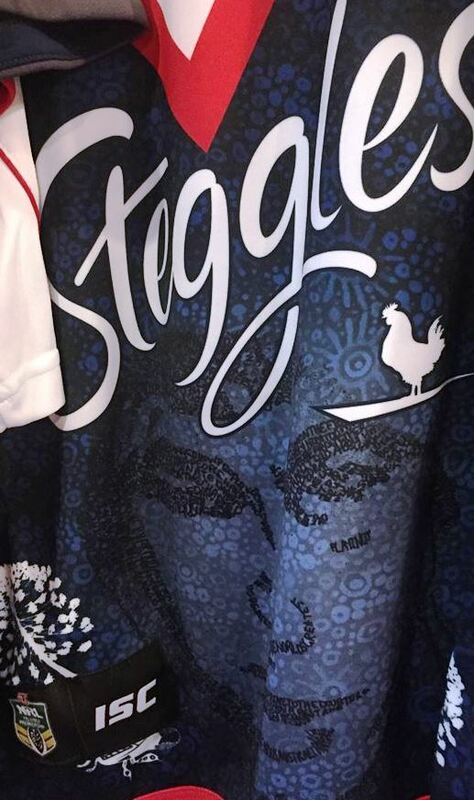 Mate when I die there is enough Roosters jersies so everyone could wear one. What are your top 5 things in your collection? 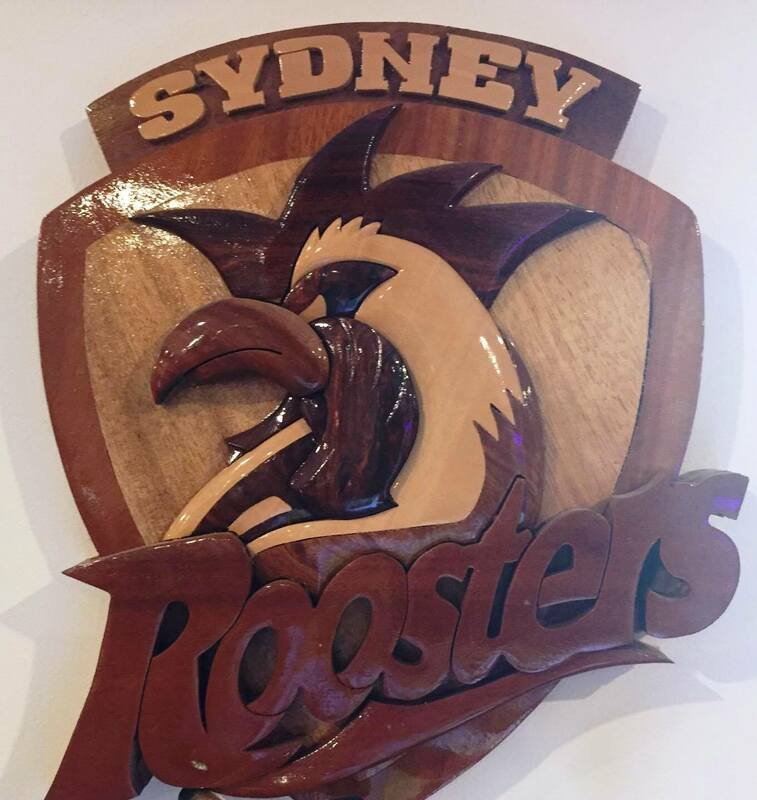 I like the wooden Roosters emblem, I like the different timbers and the idea that somebody has made that. It is just different and I just like it. 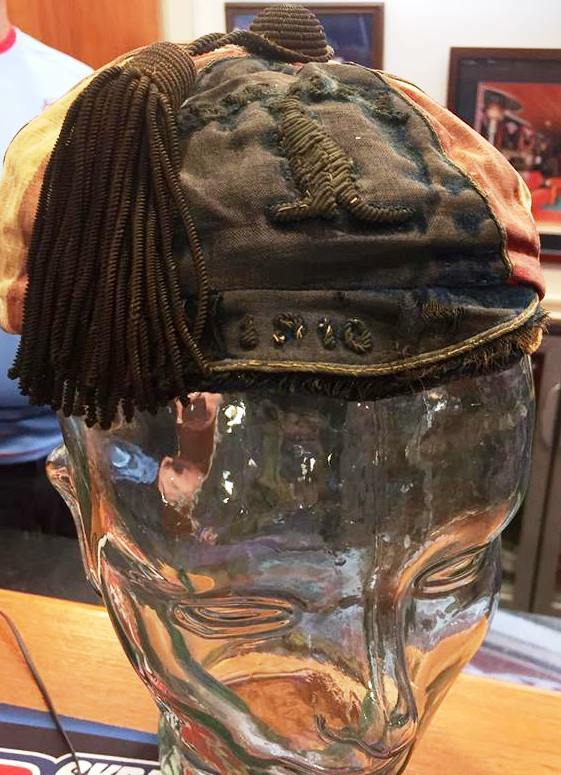 Dan Frawleys Kangaroo hat from 1910, he was the 7th player to be picked for Australia for Rugby League. In those days when they played for Australia they were given a hat in their team colours. I managed to get hold of it from a mate who knew a bloke, whoe knew a bloke, who knew a bloke who knew that I collected stuff. That cost me a few bucks. What I want to do that eventually is to put that on a head that turns and have a little video display of Dan Frawley playing. The sign was a present from my wife and kids for my 40th birthday. My mate came to deliver it to my house and I was wondering what he was doing here. 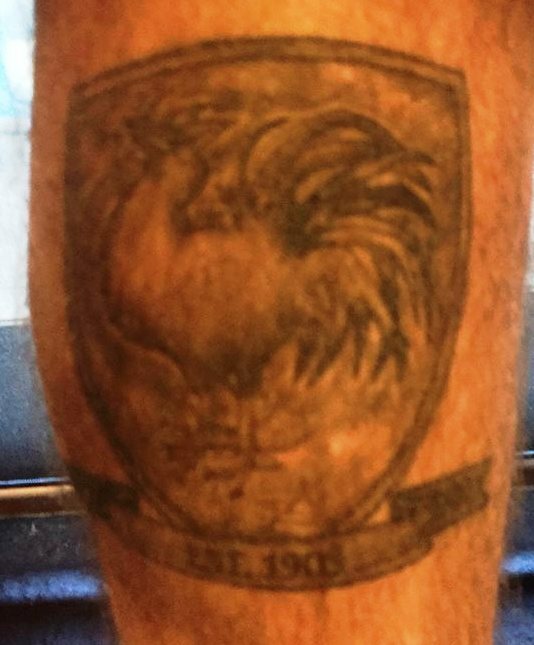 My mate is a massive Dogs fan and it must have killed him to do it and I appreciate that he did it. It is a one off sign that no one else has. 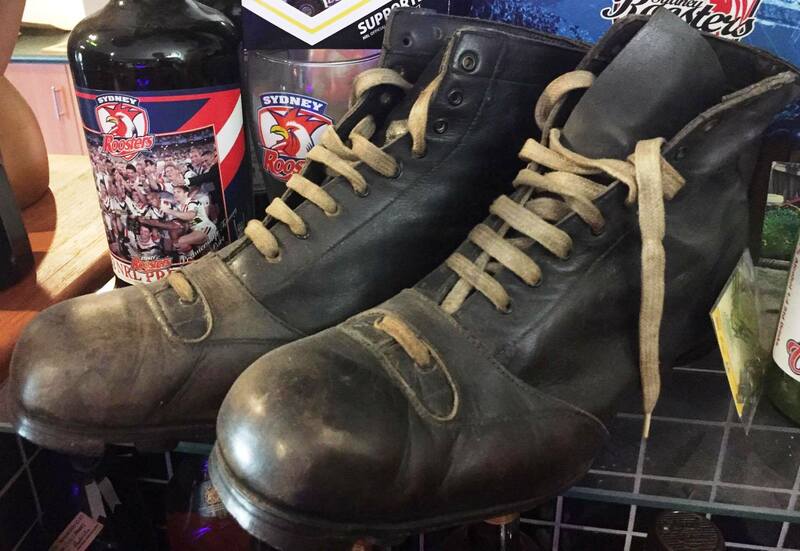 Dally M endorsed boots from the 1930s or 1940s a footballer would have worn those, they are made from Kangaroo hide. 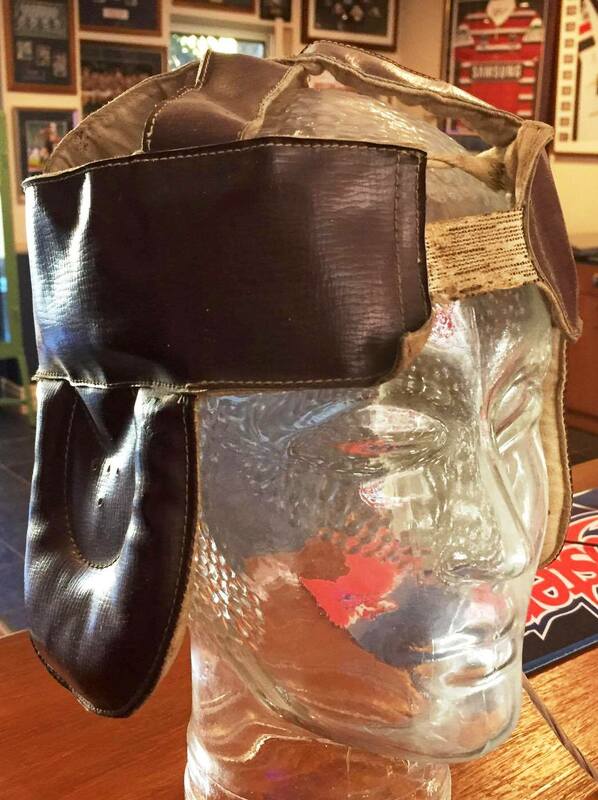 Dally M endorsed head gear and would have been worn by someone in later years. I think it would have been worn by an actual footballer around 1930s to 1940s. 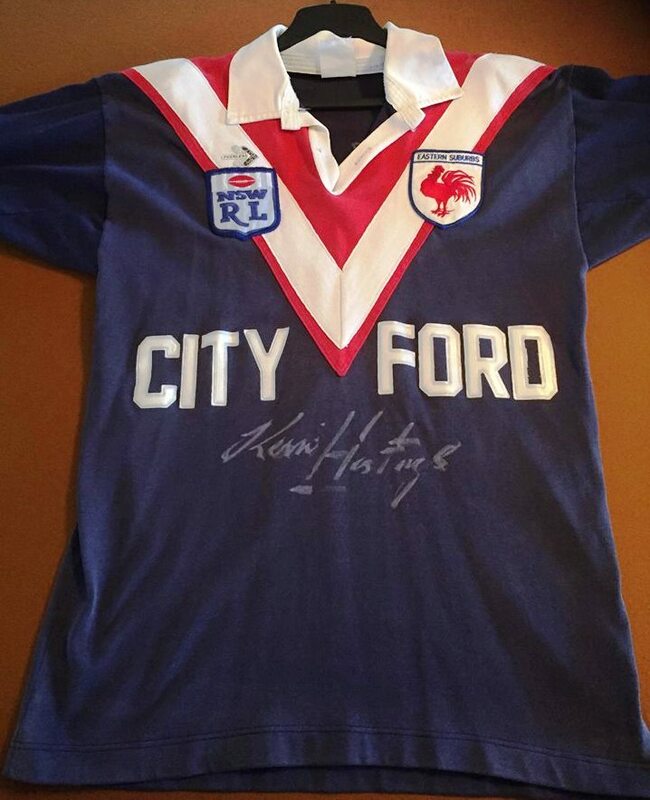 The Kevin Hastings signed jersey. There are so many things that I could pick. I have three folders full of them, Dan has done a bit of work getting them together for me over the years. There are all sorts of Roosters cards there, some old post cards, all the old Scanlens ones, Dally Messenger ones, Cains licorice ones, stickers and all sorts. I have a bunch of stickers, Ampol ones and ones that I had made up. I have a reproduction old Pop corn machine, obviously I watch the football here and get the popcorn going. I have a reproduction telephone booth which houses all of my jerseys and in the shed I have an original telephone booth which needs to be done up one day. Half of the battle is getting the stuff, once you have it you can assign time to do it up as a project but you can do it when it suits you, at least you have it. Once you've got it, you have the rest of your life to do something with it. I am working on an alternate badge frame which is comprised up of special Roosters badges, some badges are recent and have been made for special occasions such as the ANZAC clashes against the Dragons. They are quite special to me because they are hard to get. I have the Club Challenge badges and the Back to Belmore match from 2013. 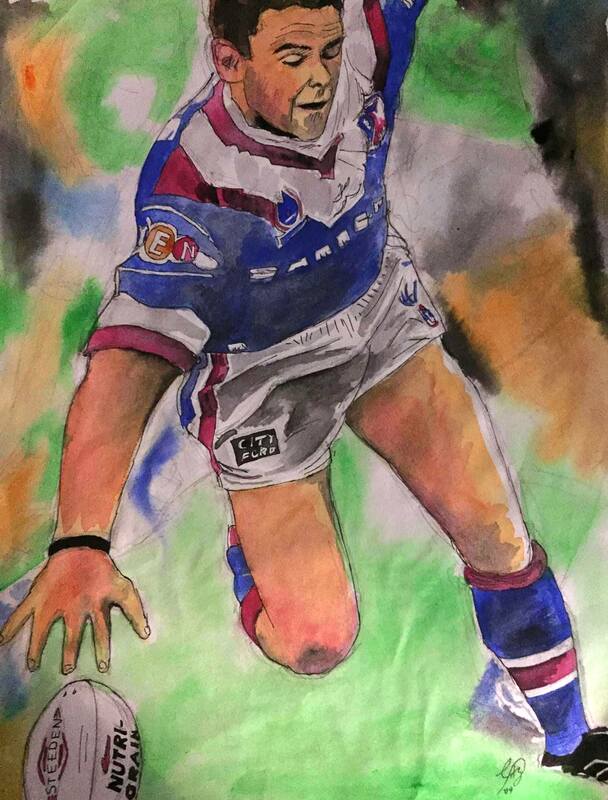 Some kids drew these pictures of Freddy Fittler and I just thought why not, something different. 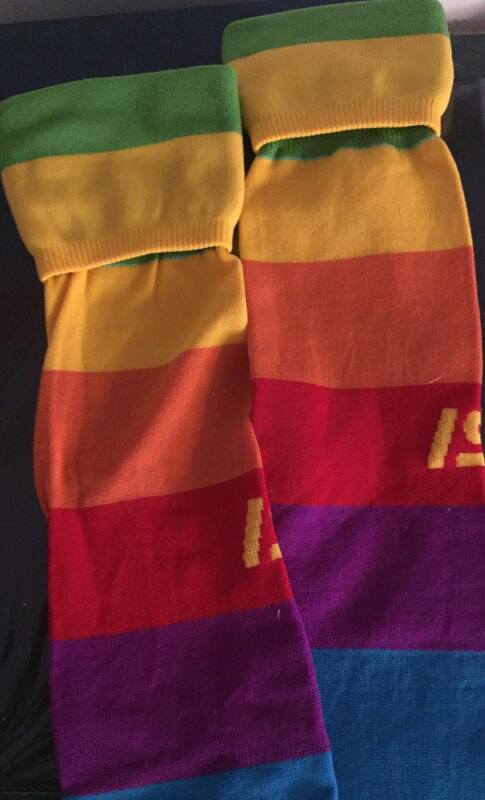 These Todd Carney socks. It was some sort of charity round and all of the players played in those. 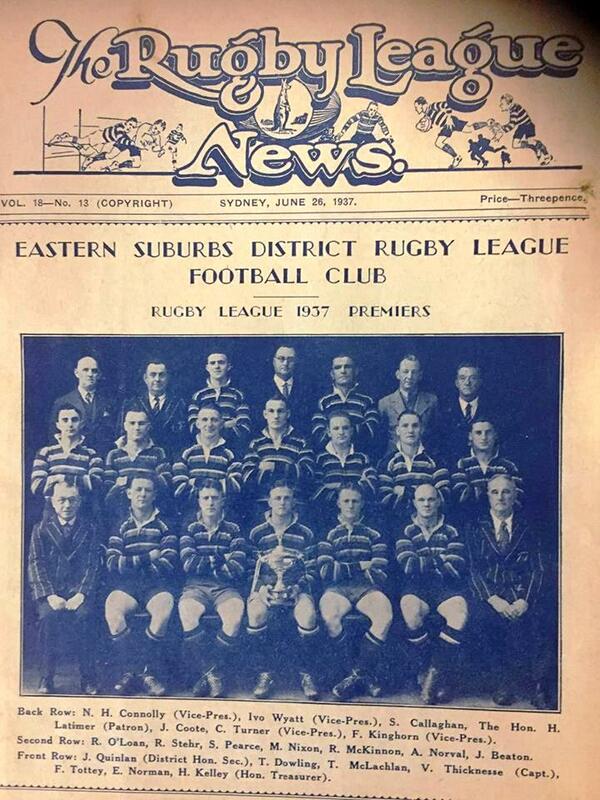 Some old Rugby League news with Roosters teams on the cover. The Artic Wolf poker machine, there is credit in there and it still works. The Club Challenge framed magazine and the framer said it looks like it has been folded as it would have been taken home from the ground. It still has the pin up and I have a spare. Kevin Hastings is my idol of Rugby League, I am best mates with him now. In 2007 I went to the opening game and I was in the grand stand and the lady next to me was on the phone and she said I am really sorry for making noise and I said it is alright, I am just watching the game. I was in a private function, she said to me what is in your bag and I said a jersey and I'd like to get Kevin Hastings to sign it, she said why? I told her he is one of my favourite players and she said I am his wife Lyn. So we got chatting and I got to get my old jersey signed with a white pen. He signed it beautifully, we have had a few beers together. Kevin travels back and forward to the United States. We were at a Hall of Fame dinner and I asked him for a photo and he took the Hall of Fame medal off and put it on me, which is pretty cool. Down to earth bloke, great club man and great guy. 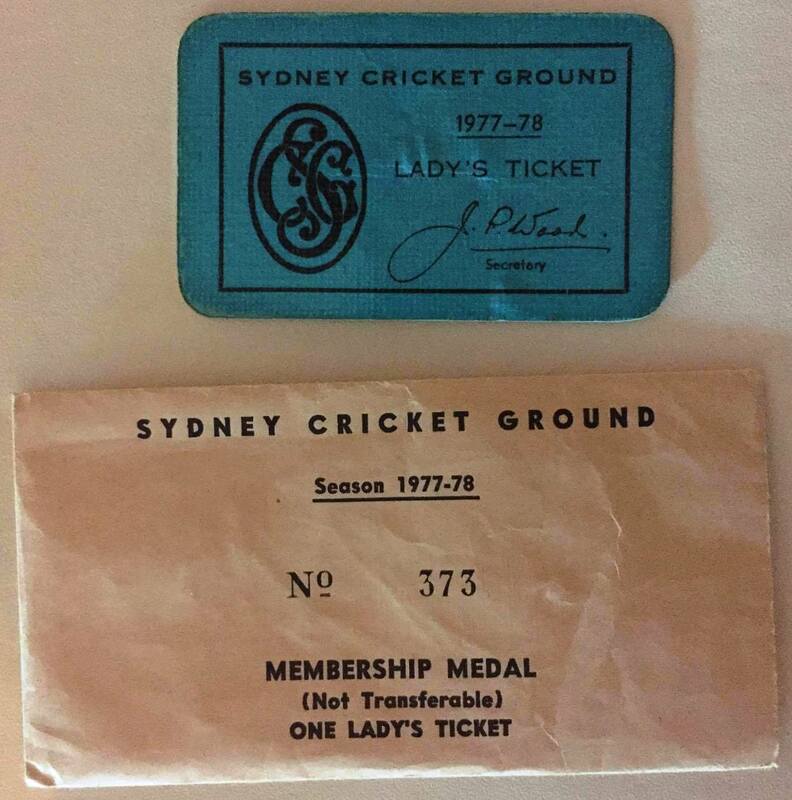 I like to collect odd and unusual items such as a ladies ticket for the SCG. 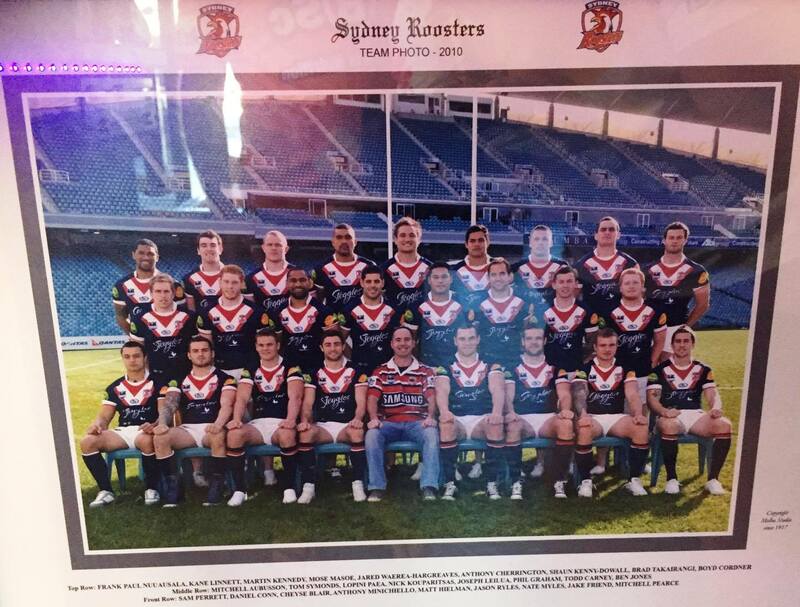 As a Roosters member I was invited to have a photograph with the squad. 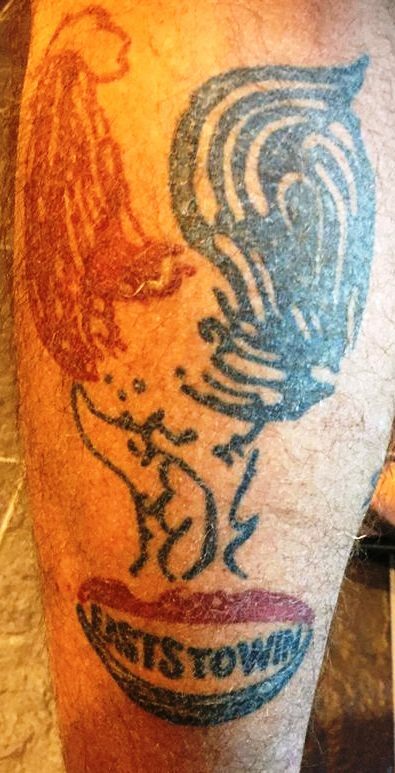 I also have a clouple of tattoos that are Rooster related. Bruce Springstein is my other idol. I have seen him 28 times. The last time I saw Bruce I was up close and really enjoyed it. Over the Years how did your collecting change? 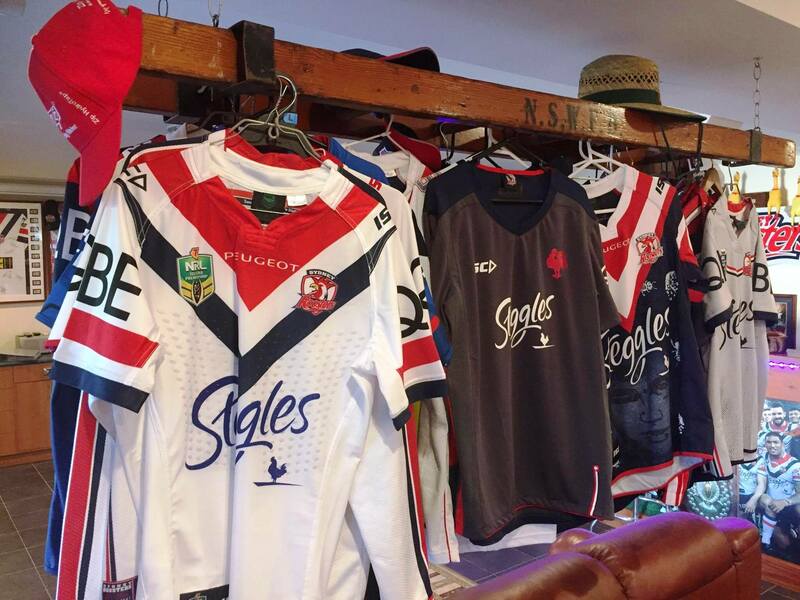 When I first started I would probably buy anything that was Roosters related, and now I don't just walk into a shop and see a hat or shirt because I too many now. 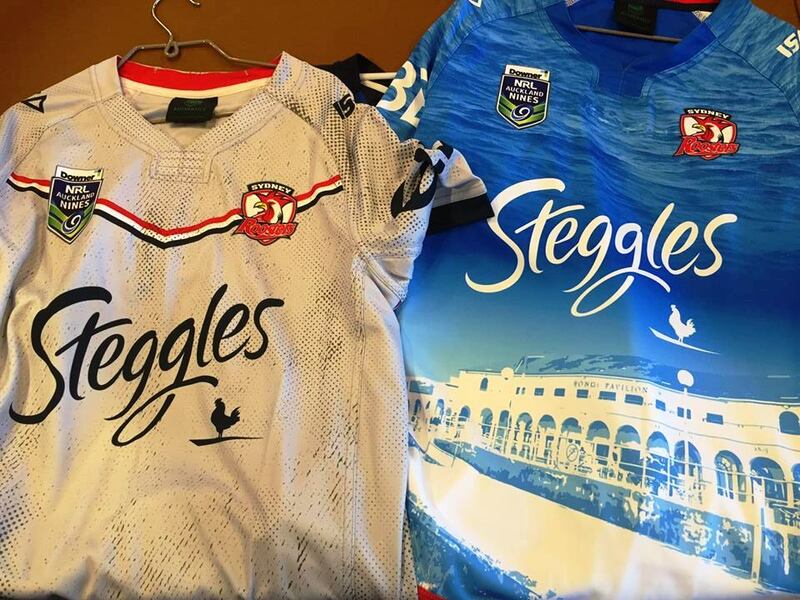 I don't buy every home and away jersey now, it is only a sponsor change. The marketing division of a lot of these places let people down now, it is all about the dollar. They will make mass produced stuff for the normal people but won't make anything out of the ordinary for the higher level members. 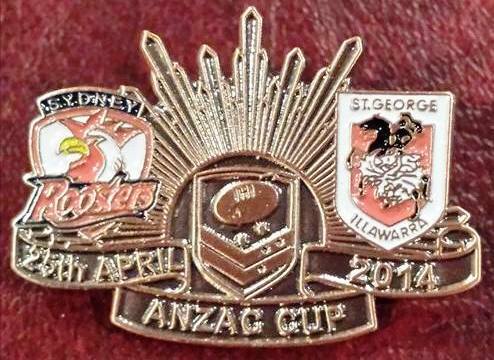 The ANZAC jersey this year was just a Poppy on the front of it and it came out just a few days before the game. If you live out where I live how do you go and get that jersey to wear to the game? It was as if it was an oversight. This is what berates me. The St George had Poppies all over the V. Anzac comes around the same time every year and no thought was put into it. They put so much effort into the Marvel round which is a non consequential round, it is a chance to make more money. I didn't buy it this year. Living out here my priorities have changed somewhat. While it is an amazing room, I don't spend much time in it. I am out in the paddock and play with the dogs and in winter time I watch the footy in the lounge room with the fire going. What is the Holy Grail that has eluded you over the years? The rest of the Associate badges, I may never see them and if someone wants to offer me the Luke Ricketson jersey signature card at a reasonable price I might take it. They are about $400 a card and that money can go a long way somewhere else. I don't put any value of a jersey more than any other, to me they are all the same. I wear most of them. I look after everything I have got. There are some cards that I think are more valuable than others, and we are not talking about in dollars. 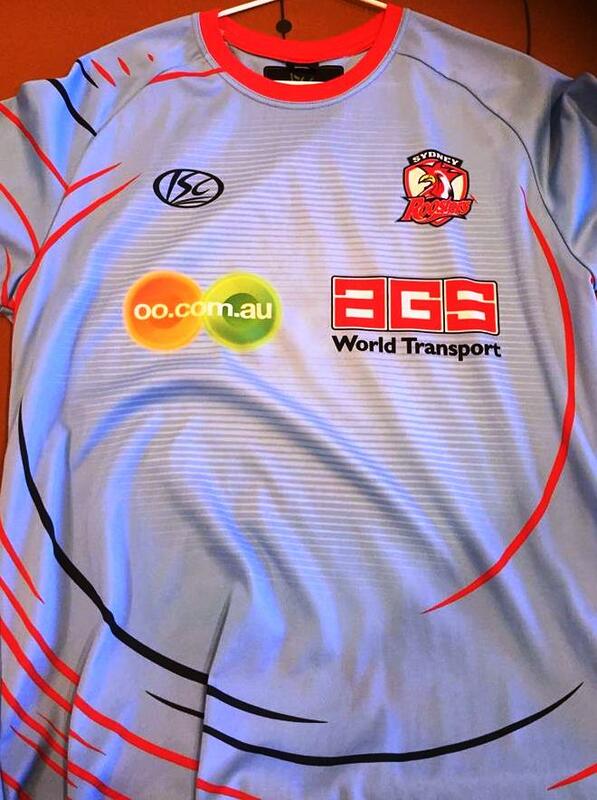 Look these jerseys come out and they cost $160 then you see them in the shop the following year for $50 - $60. I buy them early because I like to get them and wear them. Some do sell out. The cards I get most of the cards from you, Dansnrl, I don't worry too much about ebay, I go straight to the source you and you give me a good discount. The badges they can start at $2 and some go for $200. If I needed to sell the badges they would sell, they are very collectable. There is this old team picture I picked up pretty cheap and it is probably not worth much to anyone else, it is a picture of the Third Grade side, not the First Grade, but to me it is a talking point. I like to get different things. It is never about the money, I just like to collect different things and to be honest I am struggling to find something that tickles my fancy. It is more the hunt. You could put two and two together and add up the jerseys. I don't smoke, I enjoy it. You could ask me what I spent it is probably more than it is worth. It wouldn't be the badges, it would be the jerseys. I have enough and I have 1978 and 1986 Kangaroo teams and the State of Origin ones that my mate has had signed. I love my footy all around.